DANE SHOWS HOW EASY IT IS FOR ISLAMONAZIS TO WALK ACROSS DENMARK-GERMAN BORDER…….. – The Tundra Tabloids……. DANE SHOWS HOW EASY IT IS FOR ISLAMONAZIS TO WALK ACROSS DENMARK-GERMAN BORDER……..
Time to remove Schengen policy for open borders…..
A DANISH citizen claims to have shown how “pathetic” the security is between the German and Danish border. The man, dressed as an Isis fighter with a fake gun and the terror network’s flag, claims in a video to have crossed the border several times. In his several alleged crossings back and forth between the two countries, not once is he stopped or questioned by any authorities. The video, uploaded to YouTube, has not been verified and it is not clear where exactly it was filmed. It comes almost a week after Isis claimed responsibility for the Berlin terror attack, which claimed 12 lives and injured many more, on Monday. 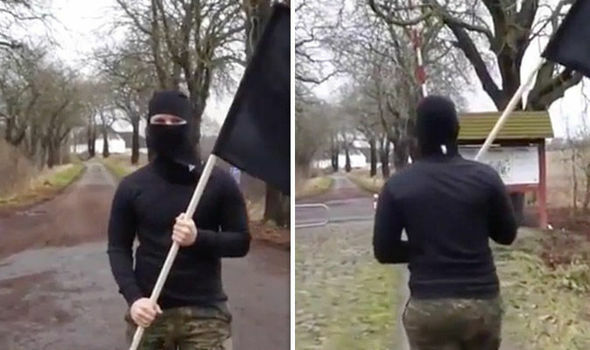 Alongside the video, the uploader writes: “A Danish citizen dressed up in Islamic State gear, flag and fake gun to show how pathetic the border is between Germany and Denmark. Previous Post Previous Post ELLIOT ABRAMS: OBAMA’S DISGRACEFUL AND HARMFUL LEGACY VIS-A-VIS ISRAEL……. Next Post Next Post ITALY: POLITICIANS CLAIM “WE’RE LIVING IN TIME OF WAR, SCHENGEN OUT OF CONTROL”…….